This is an RDA experience inside of an RTA configuration. Bravo RTA was designed by WOTOFO & Aaron Hart, owner of 5Bravo. Sp part of the reason to create the BRAVO RTA was to disrupt the norm. To have a regular guy that’s not a vape celebrity but a huge vape enthusiast to create a product. You must be of legal smoking age to buy and/or use any White Mist Co. Product. This product contains nicotine, a chemical known to cause birth defects or other reproductive harm.This product is not intended for use by persons under legal smoking age, nonsmokers, women who are pregnant or breastfeeding, or persons with or at risk of heart disease, high blood pressure, diabetes, or taking medicine for depression or asthma. This product contains nicotine. If you are allergic to nicotine, propylene glycol, or any combination of inhalants, if you are pregnant or breast-feeding, or if you have a heart condition, diabetes, high blood pressure or asthma, consult your physician before using any White Mist Co. products. Discontinue use and consult a physician if you experience nicotine misuse symptoms such as nausea, vomiting, dizziness, diarrhea, weakness and rapid heartbeat. Our products do not treat, diagnose, or cure any disease, physical ailment, or condition. Keep out of the reach of children and pets as ingestion of certain pieces can present a choking hazard. Nicotine can be toxic if inhaled or ingested in large doses, and may cause irritation to eyes and skin if exposed. Wash immediately with soap and water upon contact. Nicotine is highly addictive. There is an inherent risk with the use of any and all rechargeable batteries in any circumstance. White Mist Co. is not responsible for damage if there is any modification of the batteries/chargers. White Mist Co is not responsible for any damage caused by the misuse and/or mishandling of Li-ion (Lithium-ion), LiPo (Lithium-ion Polymer) and any rechargeable batteries and chargers. White Mist Co. will not be held responsible or liable for any injury, damage, or defect, permanent or temporary that may be caused by the improper use of a Li-ion (Lithium-ion), LiPo (Lithium-ion Polymer) and any rechargeable battery/batteries. Please have a basic understanding of the batteries you are using and how to care for them properly. White Mist Co. does not manufacture any hardware products we sell and therefore may not be held responsible for manufacturing defects, inappropriate usage, modification, or uses other than intended. Every electronic device requires maintenance and care. Failure to properly maintain your electronic cigarette, inappropriate usage, modification or damage caused by abuse or mistreatment of the product will result in invalidating any warranty claims, and constitutes an assumption of liability on the part of the user. Electronic Cigarettes in Pakistan are also referred to as ecigarettes, ecigs, eshisha or ehooka. Traditional cigarette users and shisha users can use electronic cigarettes as a safer alternative to their habits or with the intention of quitting. We deliver to all cities and provinces in Pakistan, and not limited to metropolitan cities like Karachi, Lahore, Islamabad, Hyderabad, Peshawar, Faisalabad, Multan and Quetta.Regardless of where you’re located and/or if you’re a cigarette , ecigarette or shisha user,you can enjoy White Mist Co. eliquids with your choice of electronic cigarette or electronic shisha, however you prefer to refer it as. The Zeus DUAL RTA by Geek Vape is the continuation of the wildly popular Zeus platform, integrating an updated postless build deck with four terminal openings to accommodate single or dual coils while maintaining the dynamic, leak-proof top airflow design. Now measuring in 26mm in diameter, the Zeus Dual RTA maintains all the creative headlined by the ergonomic top-fill, top airflow structure. The maximum eJuice capacity is 4mL, accessed via a threaded top-fill method. The user-friendly postless build deck implements four terminal openings, capable of handling creative single or dual coil configurations. The airflow channels are optimized for flavor and vapor production, entering through the two external top airslots that travels downward to the atomizer base. Then, it redirects into two internal side slots and across the coil chamber before rising vertically through the wide chimney. 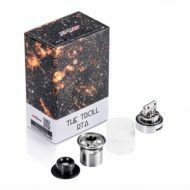 Furthermore, the Zeus Dual includes an 810 Delrin widebore drip tip with the optional 510 Delrin widebore drip tip and 510 drip tip adapter for extended versatility. The SMOK TFV12 Beast Prince presents the next rendition of high-caliber Sub-Ohm system, retaining the high-performance features from the TFV12 Cloud Beast King with significant upgrades to the structure and introducing the new V12 Prince Coil System. 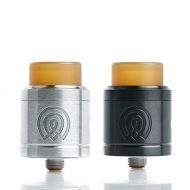 The Vaporous RDA by Wotofo is rebuildable dripping atomizer that features a very unique build deck. The Vaporous RDA features a high dual clamp post build deck with four diagonal slotted post holes. The diagonal design allows for multiple installation options for a wide variety of coil builds. Experiment using the unique design of the build deck to find your own favorite coil build. The Vaporous RDA is designed for both single and dual coil configurations. The Vaporous features dual airflow slots that may be adjusted to your personal preferences. A delrin wide bore chuff cap is included for an incredible amount of vapor production. A bottom feeding squonker pin is also included for squonk/bottom feeding mods. We are a high-end electronic cigarette provider in Pakistan and offer premium e-liquids in Pakistan. Our range of products include, e-cigarette starter kits, batteries & mods, tanks / clearomizers and ecigarette accessories. We offer free cash on delivery options throughout Pakistan.